Animal Crackers refer to a particular type of sweet-tasting crackers that are shaped into various circus animals. In the late 1800’s, animal-shaped cookies (or “biscuits” in British terminology) were introduced from England to the United States known as “Animals”. The earliest recipe of “Animals” we found in print appeared in a commercial cooking book published in 1883. The demand for these cookies grew to the point that bakers began to produce them domestically. 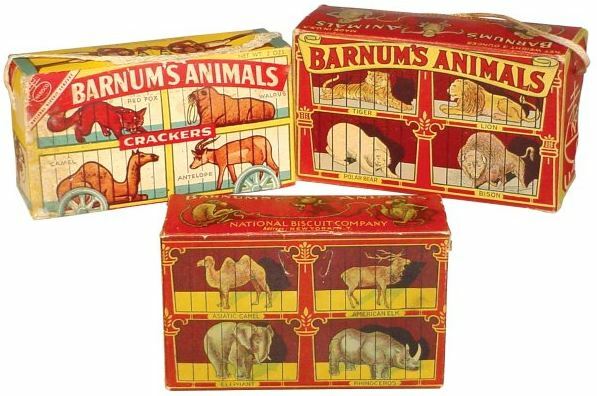 In 1902, the most popular product we know today as Animal Crackers (Barnum’s Animals Crackers) was officially introduced to the public by the National Biscuit Company. This fun, scrumptious treat was packed in a circus train looking box and was initially designed as a Christmas tree ornament with the string on the box. The name of Animal Crackers was after P. T. Barnum, the famous circus owner and showman. 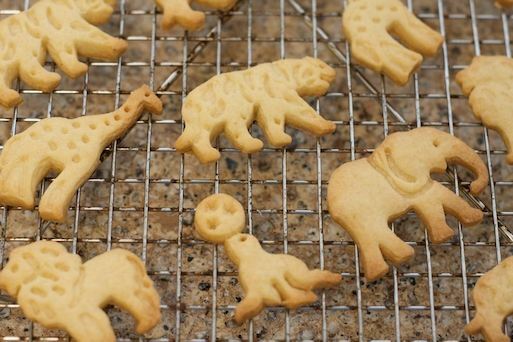 Over the years, 37 different animals in total have been featured into Animal Crackers, while the only ones survived the entire lifetime of the product are bears, elephants, lions and tigers. One funny trivia is that even Shirley Temple sang “Animal crackers in my soup, Monkeys and rabbits loop the loop, Gosh, oh, gee, but I have fun! “, rabbits have never found their way into a box of Animal Crackers to this day. Today, each box contains 22 crackers with 19 different animal shapes, which are 2 bears (one sitting and one standing), a bison, a camel, a cougar, an elephant, a giraffe, a gorilla, a hippo, a hyena, a kangaroo, a koala, a lion, a monkey, a rhinoceros, a seal, a sheep, a tiger and a zebra. In the 100th anniversary of the Animal Crackers, the koala became the latest addition by beating out the penguin, walrus and cobra in the customer survey. Today, Animal Crackers are all backed in a 300-foot (91 m) long traveling band oven in the Fair Lawn, New Jersey Bakery by Nabisco Brands. There are more than 40 million packages of Animal Crackers are sold each year, both in the United States and exported to 17 different countries in the world. Those fun-to-eat treats have always been quite popular among both children and adults, probably because they are part of everyone’s childhood. Also, there are many references of Animal Crackers in popular culture. For example, the Shirley Temple’s song mentioned earlier was used in many Animal Crackers commercials. Also, it was the name of a 1930 Marx Brothers’ popular musical and its film. Jennifer Frey. The Modern History of Animal Crackers. Sarasota: Herald-Tribune, December 31, 2001. William Cahn. Out of the Cracker Barrel: The Nabisco Story, From Animal Crackers to ZuZus. New York: Simon and Schuster, 1969. Thanks for this post – I love animal crackers, as does my son and husband too and it’s cool to know they were first made in my birth town of York, PA! Yay! Ours have icing on them too. I used to love these as a kid. This is some awesome food history site! Thanks! I love food history. It’s all about those things I sHOULD have known or heard of but never have. You’re welcome. Some of your histories are simply fascinating. What I want to know is why did they taste so very much better when I was a kid? Going to have a look for those when I’m over .. there. I love animal crackers. They are so nostalgic. Thanks for the interesting details, as usual!